by Deborah Blake. © 2014 Llewellyn Publications. 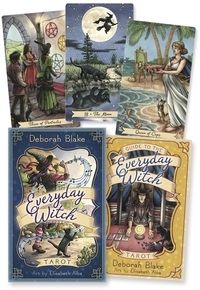 Everyday Witchcraft is a book for today’s Witch—busy and overwhelmed, but still longing to find a way to make a spiritual connection and integrate her Pagan beliefs with her everyday life. Simple, fun, and easy to follow, this book is both practical and empowering. Includes “5 Minute Rituals” along with suggestions for easy daily or monthly practice. Bring magick into your everyday life!